Hemlocks are beautiful, evergreen trees that are native in New York’s forests, and feature several key identifiable features that make them easy to tell apart from other conifers. Since hemlock woolly adelgid only infests hemlock trees, knowing how to successfully ID hemlocks is an important part of scouting for and reporting sightings of HWA in the field. Hemlocks are mainly found in areas with moist, slightly acidic soils and on steep, north-facing slopes. They are also often found along streams and lake shorelines. In the Finger Lakes, many of the iconic gorges are lined with hemlocks. 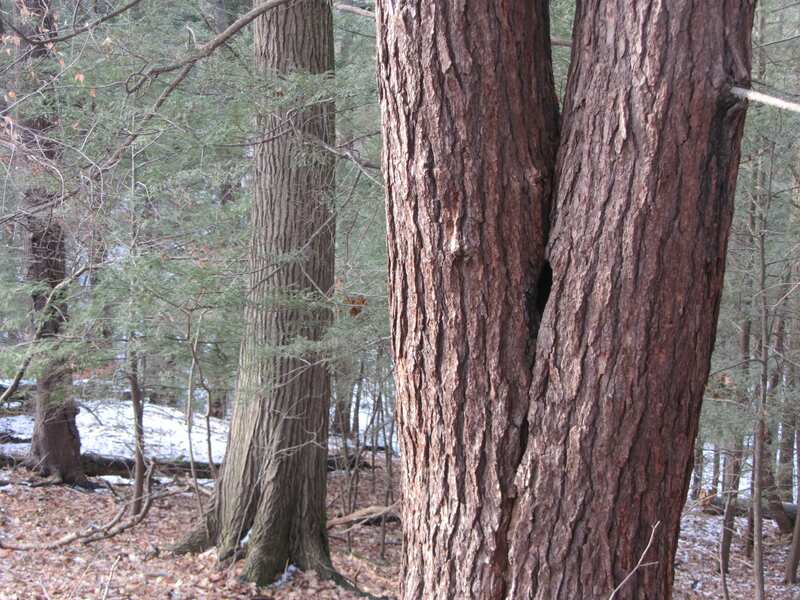 In New York, most hemlock trees are concentrated in the Adirondacks, but you can also find many hemlocks on the Tug Hill Plateau and in the Catskills, particularly in the northern Catskills and Catskill High Peaks region. You can test your hemlock identification skills with our Hemlock Tree ID quiz. Hemlocks have a vaguely pyramidal shape with a drooping leader at the top and feathery branching texture. Hemlocks can grow to be up to 175 ft tall. As they grow there may be fewer lower branches present. Hemlocks have lacy, feathery foliage. In the late spring and early summer, new hemlock shoots should show up bright, lime green at the ends of twigs. If you do not see new shoots emerge, it could be a sign of an HWA infestation. 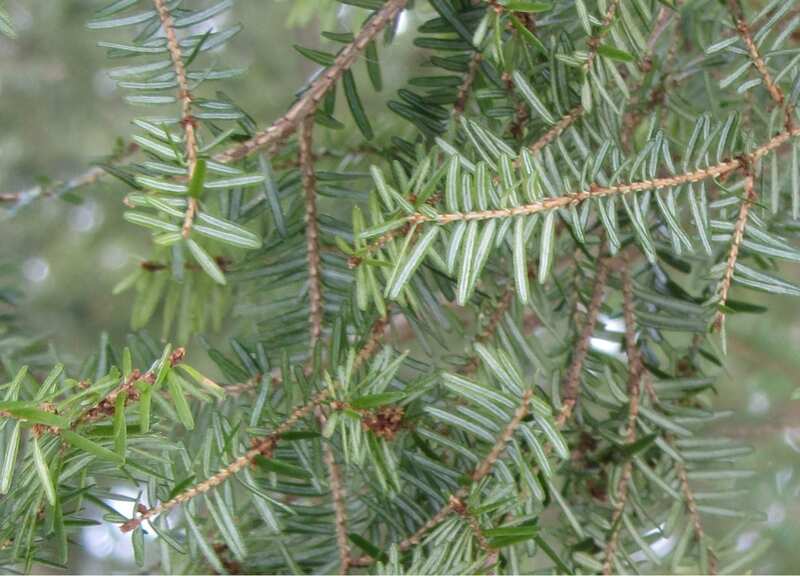 Younger hemlocks will have rough greyish-brownish bark. Mature hemlock bark is rough, scaled, and fissured. It is typically a rich brown in color with a reddish tinge. Needles are flat with a shiny deep green top, two parallel white stripes on the underside, and a rounded tip. Needles are typically ~1/2” to 3/4” in length arranged opposite one another on the twig (not whorled around the twig as on a spruce or fir tree). 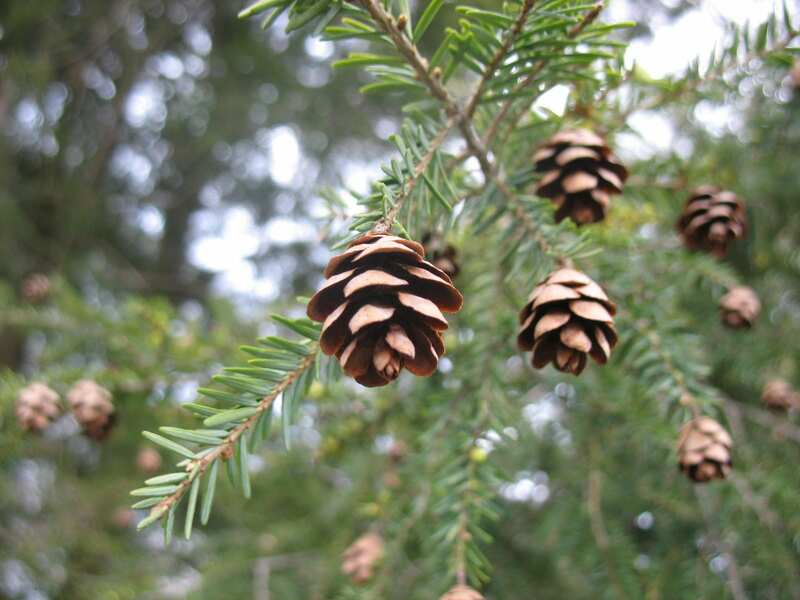 Hemlocks have small, brown cones that grow to be ~3/4” to 1” in length. They have rounded scales and mature in the fall. For more information on identifying hemlocks in the field you can check out our Hemlock and HWA Identification Guide. Download and print to take it along on your next hike! The Arbor Day Foundation’s What tree is that? can help with some easy guided questions. The Brandeis Conifer Field Guide allows you to view selected species side-by-side as you learn to differentiate them. 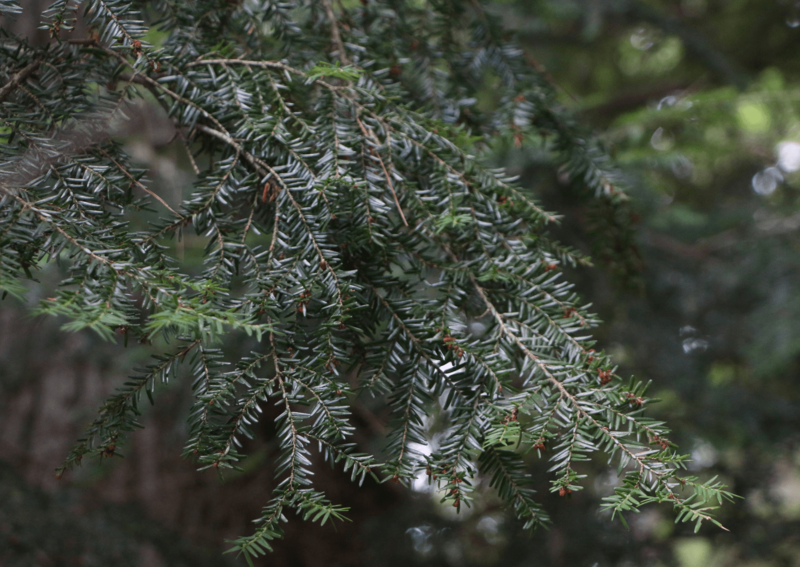 For auditory learners, Cornell’s ForestConnect has a great dendrology crash-course video to help you identify and understand the ecology of Northeast conifers.